private practice. In fact, in the last ten years, only about 13 per cent of LAWPRO malpractice claims were caused by lawyers getting the law wrong (except in very complex areas like family or tax law). way to ensure miscommunications don’t happen. If meeting in person isn’t possible, at least pick up the phone to avoid misunderstandings when important matters need to be discussed. There are a number of things you can do to avoid missing a crucial deadline. Familiarize yourself with the Limitations Act, 2002 by using the practicePRO program’s limitations resources at practicepro.ca/limitations. Use practice management software with tickler systems to alert you to approaching deadlines. Be aware of the danger of the registrar dismissing an action for delay under Rule 48 of the Rules of Civil Procedure (see our Rule 48 Transition Toolkit at practicepro.ca/rule48 for help). 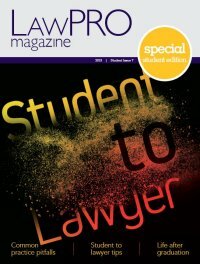 LAWPRO’s claims counsel on the common mistakes they see lawyers making and how to avoid them.